Village Bandala (near the present Amritsar) has been capital of the Hoon tribe that entered India from Central Asia in the 5th C AD. Sometimes back we had identified a huge stupa base in the village Bandala. A long wall was also discovered by some people some years ago. Since the Hoon under the emperor Mihirkula were opposed to Buddhism, they demolished many Buddhist monuments and annihilated monks. Bandala is also known for its huge Yogi monastary locally called Asan. Hoons are considered as a savage tribe in history. When they would attack they would move like a swarm. They would make the subdued people join them if they were not massacred. In North India the swarm is called 'dal' the mob or crowd. The Hoon movement was thus called Hoon Dal or Hun Dal. It is for this reason the local population of the Jatts is called Hundal. 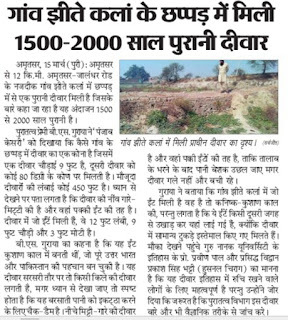 The advance of Hoons were checked by the Malwa (of MP) Aulikara king Yashodharma. Yashodharma erected huge monolith pillars near Mandsaur commemorating his victory over the Hoons. Recently during our visit to village in connection with a marriage we have discovered a wall which is 8 feet wide and about 450 ft. long. We were baffled to see the base of the wall is made of mud and the two walls don't meet each other at the angle of 90 degree. The backed brick used in the wall is the one which was common during the Kanishaka Kushan period i.e 12" x 9 x 3. The broken bricks are used in construction. Here our friend S.P. Ahir came to our rescue when he suggested that it could be that the bricks from some other Buddhist monument were used. 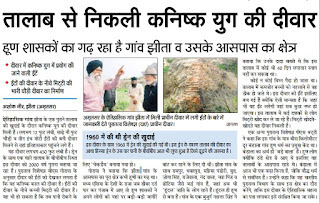 Recently the base of a stupa at was discovered at Bandala village which clearly showed that the stupa was demolished, and its bricks taken away. 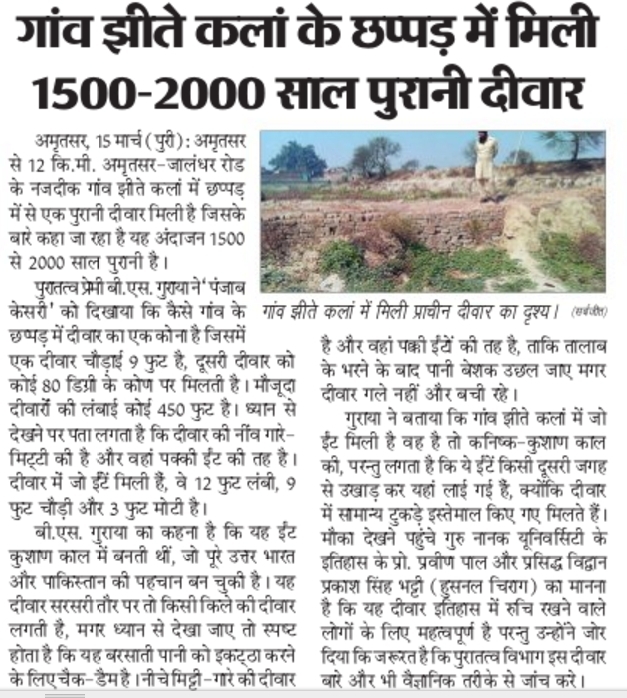 Now the poor farmer in whose house the stupa base has been discovered has used the stupa base bricks for his floor. Please see the link given at the bottom. 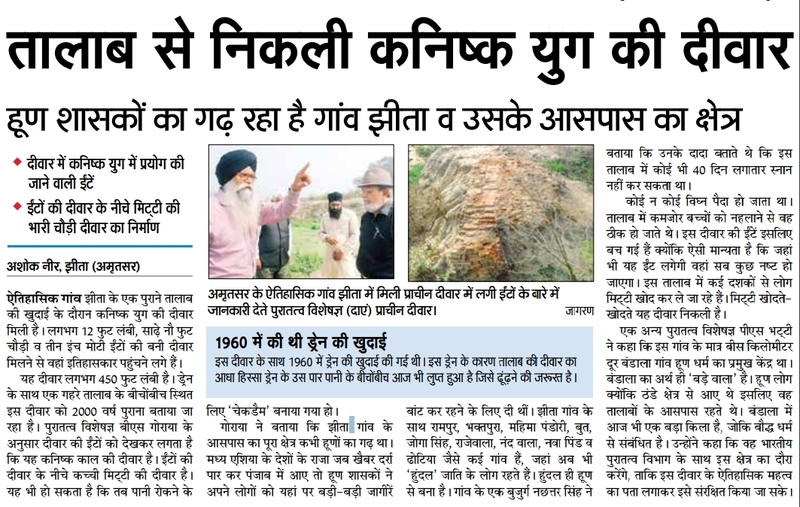 Thus Ahir appears to be correct in suggesting that the bricks are re-used to make a check dam. Then the question arises when the dam might have been built. On marking the erosion of backed bricks we can perhaps evaluate the age of dam. That too appears pretty old. May be 1500 years old or may be 1000 years.